Pottery Identification - W C or C W mark:- A great great Aunts wedding collection 1858 ish we think. We would love to know what it is and whether we could buy any more, there's a few missing pieces. Many thanks and I am pleased to say I know the answer on this one. Knowledgeable contributors can add more to this (check out the comments section below for replies). Dear David, The mark on you china is that of Wileman & Co. Fenton & Longton, Staffordshire, England (circa 1892-1925). Sometimes you see this mark with "THE FOLEY CHINA" printed in an arc above the crown. The Rd No. marks are design registration date marks from the English Registry mark system. 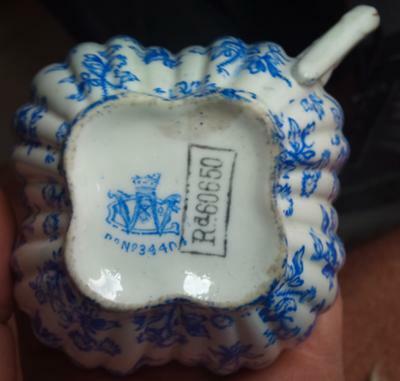 Rd No 34404 is a code for the year 1885 and most likely represents the design shapes of the china. Rd No 60650 is a code of the year 1887 and as the later date would represent the design of the decoration on the china. Prior to becoming Wileman & Co. in 1892 the company was know as James & Charles Wileman, Foley China Works. This company was established in 1864. Charles Wileman left the business or possibly passed away in 1869 and James Wileman continued the company under his own first & last name until he left or died in 1892. The business continued under new ownernship/management from 1892 to 1925 under the Wileman & Co. name. In 1925 it became Shelley Potteries Ltd.
Based on the late Victorian style of the decoration, the white blank china would have probably been made between 1885-1887 and the decoration fired onto the white blanks most probably between 1887 and 1897.